Honda Shadow Forums : Shadow Motorcycle Forum > Local Discussion > South Western Riders > Las vegas riders!!!! I just moved to Las Vegas last month and am looking for a few good riding buddies. I live on the SW corner off 160. I love to ride and have been checking out how far everything is. Anyone else out there want to go on 400+ mile round trips in one day with me? lol! Of course they all won't be, my body would be screaming from abuse, but every now and then I have to get out and ride all day long. This list is only just beginning and I may not venture out on all these. I don't know much about cool places in NV yet, except the super duper far away Lake Tahoe! I know of some places like Red Rock and Mt Charleston that are pretty close as well but haven't been yet. NOTE: I have been getting over a lot of injuries from 2.5 previous accidents in 07-08, so I'm not as hardy as I used to be but I'm still young enough to keep going ( only 28 )! I also have a slight fear of tight curves that I have been slowly but surely getting over from those accidents as well, sportbikes were awesome but not my cup of tea apparently. I've come a long way since 2008 but I still have a long way to go, I am no quitter!! So if you are willing to be a part of my "recovery team", that would be awesome! I need all the support I can get! Current:2011-? 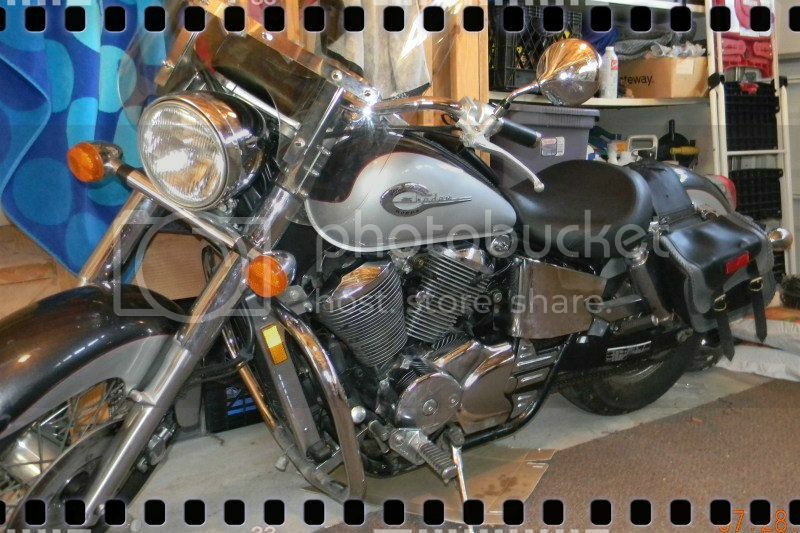 2004 Honda Shadow VLX 600, ~6000mi and counting! If you venture up to Tahoe, let me know. We'll have a girls ride! So the short way to get to Tahoe... is part of it really bad/dirt roads?? I've been hearing awful things about it. There are different ways to get up there. You can pick easy or difficult. But, no need to hit any dirt. interesting! I will have to do some research on routes then. I rode to Las Vegas in March. it's a 550mile ride each way from where I live, but it was a fun ride. I hit Tahoe a LOT! Actually I've put almost 8,000 miles on since Feb. Come to think about it, my poor little 750 will be dead in no time. Greetings from a local Shadow rider. New rider in Vegas looking for a good or better mechanic. Too old to bend over and have no garage to work on my bike. I will be looking for someone to paint my tank after the first of the year also, it came with an owie. That is 1/2014, sometimes it is hard to tell here. I just got my license and don't ride much, hoping to put in more miles once we have gotten over our imitation of back east weather. Just wanted to let it be alone there is another rider in Vegas here. Where I'm at with the project right now.